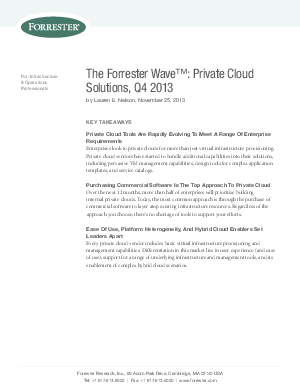 In Forrester’s 61-criteria evaluation of private cloud solution vendors, we identified the 10 most significant software providers — ASG Software Solutions, BMC Software, CA Technologies, Cisco Systems, Citrix Systems, Eucalyptus Systems, HP, IBM, Microsoft, and VMware — in the category and researched, analyzed, and scored them. This report details our findings about how well each vendor fulfills the breadth and depth of our criteria and where each stands out to help infrastructure and operations (I&O) professionals select the most full-featured private cloud solution. I&O pros can also customize criteria weightings to align with their own private cloud initiative.